Take the A499 out of Pwllheli towards Abersoch. At Llanbedrog turn right up the hill on the B4413 towards Aberdaron. 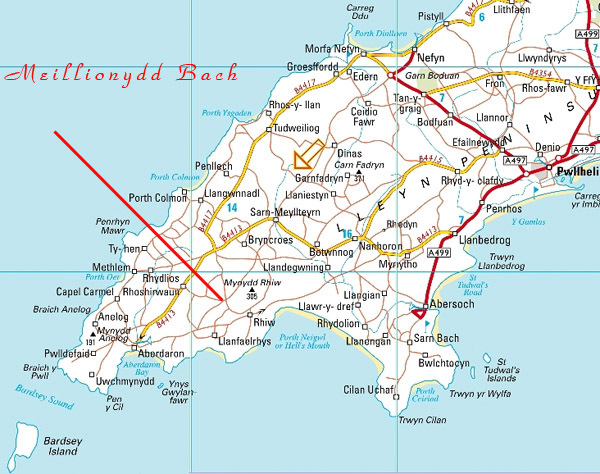 You will pass through villages called, Mynytho, Botwnnog, Sarn Meillteyrn and Pen y Groeslon. At the next village Rhoshirwaun, turn left at the old chapel just after the garage. After approximately 0.5 of a mile, take the first left. Meillionydd Bach is 0.9 miles on your left. Look out for the old water pump outside! If you are coming from the Pwllheli direction, turn right at the crossroads in the village, then take a left at the top of the village. Meillionydd Bach is down the second lane on your left, approx. one mile from Rhiw.